Green Revolution was comparable in magnitude to the impact of the industrial revolution on manufacturing and led to the rise of agrarian opposition parties in India. There is a consensus among economic historians that technological changes act as important determinants of economic growth, but, sometimes, they can also disrupt political power. The Green Revolution had a curious political impact on the Congress’ single-party dominance in India. The Green Revolution introduced high-yielding variety (HYV) crops and strengthened the economic incentives and capacity of the politically excluded group of agricultural producers to seek greater political representation and facilitated collective action. The HYV crops and technology played a pivotal role in the rise of agrarian opposition parties. In terms of its impact on agriculture, the Green Revolution was comparable in magnitude to the impact of the industrial revolution on manufacturing. In the context of rural exclusion from the urban and elite-dominated leadership of the Congress party, the Green Revolution contributed to the rise of agrarian opposition parties. This resulted in India’s historical transition from single-party dominance to multiparty competition, and democratic deepening. It was a quintessential case of ‘political creative destruction’. An analysis of the district-level panel data on the share of agricultural land planted with HYV crops over time, geocoded to over 20,000 election races between 1957 and 1987 show the key political role Green Revolution played. These dynamics also have important implications for the political economy of development. They support the idea that entrenched political elites possess strategic incentives to block or carefully manage technological change. On the other hand, the electoral effects of positive rainfall increased rural wealth but did not change rural incentives to seek political power or capacity for collective action. This suggests that a pure wealth effect would not have contributed to political turnover to the same extent. Green Revolution increased the wealth of a politically excluded group and increased its ability to finance political mobilisation at the expense of incumbents. This corresponds to the argument that rising economic groups’ newfound wealth improves their ability to successfully change the regime. New technologies can facilitate collective action. Some technologies, such as cellular phones, have contributed directly to collective action by reducing the costs of political mobilisation by rebel or excluded groups. A technological shock primarily benefits a politically excluded or underrepresented group; a technological shock benefiting entrenched elites and incumbents would have the reverse effect of reinforcing the status quo. In many cases, incumbents lack the capacity to block or fail to anticipate the long-run consequences of technological change, providing an opportunity to observe ‘political creative destruction’ at work. History is replete with examples of technological innovations that had sweeping economic and political consequences that incumbents failed to block or anticipate. Technological revolutions such as advances in shipping, the emergence of cities, or the industrial revolution, resulted in economic as well as political revolutions. In districts impacted by the green revolution, HYV crop cultivation revolutionised agricultural productivity, resulting in a transition from subsistence to commercialised agriculture. This benefited an increasingly wealthy ‘middle peasantry’ comprised of typically lower- and intermediate-caste farmers with sufficient landholdings and the economies of scale needed to take advantage of the new crop technology, a group that, according to various estimates, represented roughly 30 per cent of the Indian population. Not only was the middle peasantry increasingly wealthy, but, as in nearly all countries affected by the Green Revolution, increasingly dependent on government-controlled economic policies. 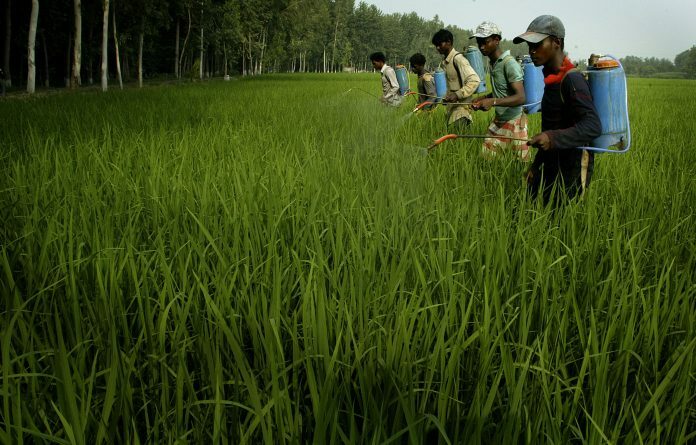 HYV crop cultivation required intensive use of inputs, including fertiliser and pesticide, electrification for operating tube-wells, and equipment for mechanised cultivation. All of these inputs depended wholly or in part on government provision and subsidisation. Moreover, the increased output of HYV crops placed downward pressure on crop market prices, making the level at which the government set crop procurement prices an increasingly visible issue affecting farmers’ profits. These economic changes converted the previously quiescent countryside into a hotbed of political mobilisation. The growing articulation of the rural ‘voice’ in the wake of the Green Revolution benefited agrarian and regional opposition parties because rural and cultivating caste groups were heavily underrepresented in the urban and elite-dominated leadership of the Congress party. By contrast, agrarian and regional opposition parties offered not only subsidies but descriptive representation for excluded rural groups. Gaining representation in state legislatures was important to gaining direct control over agricultural policies. On a more quotidian level, gaining representation in local district party branches, district boards, local cooperative societies, and elected village councils was also important, because these district-level institutions governed the local distribution of pesticide, fertiliser, agricultural credit, tube wells, seeds, and a variety of other inputs required for HYV crop cultivation. In addition to defeating the Congress party at the state level, newly emergent agrarian and regional opposition parties played a pivotal role in the Janata coalition, which defeated the Congress party in national elections for the first time in India’s history in 1977. By the 1980s, opposition parties drawing support from rural and cultivating caste groups had established multiparty competition in many of India’s states, and also played an important role in the Janata Dal coalition, which defeated the Congress party for the second time in parliamentary elections in 1989, ushering in India’s transition to multi-party competition at the national level. The rural-urban divide also corresponded to a conflict between cultivating ‘backward caste’ groups and upper caste groups. Caste associations provided an important basis for collective rural action. However, electoral institutions and ethnic rivalries cannot explain the timing of the Congress party’s decline, as elections and ethnic rivalries existed prior to as well as following the Green Revolution. It would be valuable to examine why some incumbent elites and parties are better at coping with disruptive technological change than others. The entrenched preexisting elites within the Congress party may have inhibited it from strategically coopting rising rural groups outside of the party. This suggests that organisational entrenchment and flexibility are potentially important moderating factors affecting the linkage between technological change and political turnover, a hypothesis that deserves detailed exploration in future comparative research. The author is Assistant Professor of Political Science, University of California, Merced. This is an edited extract from his report titled “Technological Change and Political Turnover: The Democratizing Effects of the Green Revolution in India”. It appeared in the American Political Science Review, 2018.